Marty's Site | …. my personal site. Martin passed away peacefully, quietly, with family surrounding him at St. Joseph’s Hospice, Sarnia, Wednesday, July 15 after a short journey with cancer, a journey he faced with remarkable courage and dignity. Remaining to cherish and keep alive the memories of a beloved father are sons Drew (Inna), Christopher, Tim (Stephanie) and dearly loved grandchildren Zoe, Cameron, Kristen, Lauren, Ryan, Aaron, Evan and former daughter in law Sandra Graham who always held a place in his heart. Also left to treasure Martin’s life is his best and longtime special friend Mary Grenkie, cousins who loved him dearly especially Marg ( Bill ) Baker and many valued close friends ; Jim Lucen, Tom Dalton ,Tony Martin ,Margaret Bird ,Gayle Solave and Karlene Frey. Martin was predeceased by his parents William and Dorothy Ellacott. Missing him already is his much loved little buddy, Stuart, who gave him wonderful companionship and comfort especially during his illness. 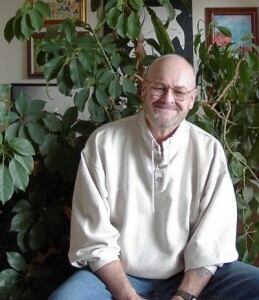 Martin had a large, diverse, world wide circle of on line friends and enjoyed many hours, daily, communicating with them on a wide range of topics. He will be missed on the Internet. Martin was born, raised and lived most of his life in Petrolia, Ontario. He worked at Union Gas for 35 years and after his retirement 1999 he moved to Sarnia where he became a member of the Sarnia Arts Workshop enjoying countless hours painting, visiting galleries and exhibiting his work. He loved cross wording and could be found most mornings at the local mall food court or favourite coffee shop enjoying coffee, cross wording and stimulating conversation with the regulars. He had a thirst for knowledge and when he wasn’t researching a topic, there was always a book in front of him with several more waiting to be picked up. He also took up biking and could be spotted daily for sixteen years, not only in Sarnia but around Lambton County. He especially loved the Watson Trail. Martin had been an avid sailor for 25 years, a member of the Sarnia Yacht Club and loved to tell the stories of his experiences on the water. He also built boats, taking great pride in the wooden ones, his favourite being Somerset. Martin was a strong presence in this life, a gifted man and leaves behind love, memories and hope for a better world for future generations. He asked that appreciation be given to Dr. William Buckton, Dr.Glen Maddison and team, VON and St. Joseph’s Hospice staff for the wonderful, outstanding care given to him during his illness. Respecting Martin’s wishes, cremation has taken place with a private family service to follow. Arrangements are entrusted to the D.J. Robb Funeral Home & Cremation Centre.